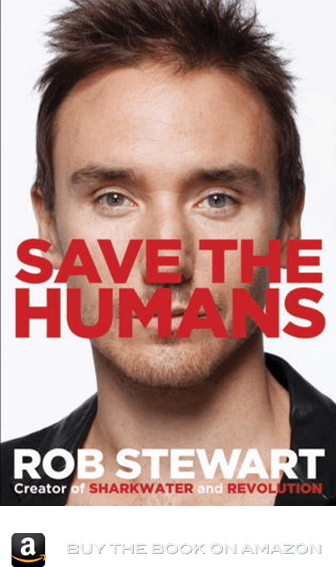 In Save the Humans, award-winning documentary filmmaker Rob Stewart tells his captivating life-story so-far — from self-professed “animal nerd” to one of the world’s leading environmental activists Rob Stewart has always been in love with creatures, the odder or more misunderstood the better. His passion for all living things, including Satan, his 7-foot-long, 80-pound pet water monitor, has led him around the world, as a university student studying zoology in Kenya, as a wildlife photographer in Madagascar and Southeast Asia, and ultimately as a documentary filmmaker in the Pacific shooting his innovative and award-winning documentary Sharkwater. Risking arrest and mafia reprisal in Costa Rica, nearly losing a leg to flesh-eating disease in Panama and getting lost at sea in the remote Galapagos Islands, Stewart is living proof that the best way to create change in the world is to dive in over your head. His documentary sparked shark fin bans around the world, but his story doesn’t end with saving sharks. Stewart has set his sights on a slightly bigger goal—saving the human species. He has criss-crossed the globe to meet with the visionaries, entrepreneurs, scientists and children working to solve our environmental crises, and his message is clear: the revolution to save humanity has started and the only thing missing is you!